Adam Salley was on target for Portadown in their 2-0 win over H&W Welders on Saturday. Dundela continued their fantastic start to the season defeating the PSNI 2-1 at Newforge. Their third win out of three starts was enough to see the Duns leapfrog Ballyclare Comrades who could only draw with Limavady United at Dixon Park. Bryan McCarroll’s newly promoted team have taken the Championship by storm this season and sit proudly at the top of the league table. Newly promoted Dundela arrived at Newforge as the only team not to have dropped a point from the start of the season. They departed Newforge with that intact. A 2 – 1 well deserved victory over a disappointing police side sent the men from east Belfast home very content. Salt was rubbed into the wound when both of Dundela’s goals were scored by former PSNI FC player, Chris Watts! His first came on 30 minutes from a neat touch at the near post, then four minutes later he did the same again, this time picking his spot from some 12 yards out. Before his brace Jordan Hughes has an excellent opportunity to put the visitors ahead on five minutes when he stepped up to take a Dundela Penalty. Tuda Murphy pulled off an excellent save. The police rarely threatened Ryan McBride in the Duns goal, until the 70th minute when McBride took down Owen Moody. The resultant penalty was converted by Lukasz Adamczyk. For the remaining 20 minutes the police upped their game and were unfortunate not to get the equalizer. Indeed, at the death Dundeal could, and should, have put the result to bed. Dundela remain league leaders with the police still chasing their first point. Comrades’ winning start to the season was ended on an unseasonably chilly night at Dixon Park, when they were made to pay for not taking full advantage of their first half dominance. The match couldn’t have started any better for the home side, as they opened the scoring inside two minutes. A corner whipped in dangerously by Christopher Crane was met by a powerful header from Jason Johnston inside the six-yard box, which gave the keeper no chance. Comrades went on to boss most of the rest of the first half, pressing Limavady back into their own half and creating chances. In the 9th minute a good link up between Christopher Crane and Gary Donnelly led to Crane getting in a firm strike from 13 yards, which Wells had to block. Then, five minutes later, a Gary Brown corner found the head of Dean Youle 6 yards out, but his effort went over the bar. The Limavady defence was being given a torrid time at this stage. On 18 minutes Thomas Robinson ran onto a ball laid off by Jason Johnston to fire in a shot from 14 yards, which flew just past the post into the side netting. In the 35th minute Comrades had an excellent chance to extend their lead. Jason Johnston was on the end of a lovely move and bore down on goal, but saw his attempt to slide the ball past the keeper from seven yards go wide of the target. Two minutes later, Curtis Woods got forward to hit a low shot from 25 yards which went narrowly wide. The visitors had posed no threat to the Comrades until the 40th minute, when they equalised, very much against the run of play. A corner was played in from the right and found Emmet Friars unmarked at the far post and he made no mistake from 5 yards. This goal immediately buoyed the visitors and they finished the half on the front foot. The second half was very different from the first in that the visitors looked far better organised defensively and Comrades now struggled to create chances. Play was evenly balanced with defences on top. Both sides were able to get into decent positions around the box, but the final ball wasn’t there. The only real effort of note at either end was in the 78th minute, when Jamie Willighan headed the ball down in the box to allow JB Dobbin to get in a good strike from 12 yards, which Wells had to tip over the bar. A 94th minute winner from super-sub Paul Finnegan earned Larne all three points from this Friday night visit to Loughgall. Marty Donnelly opened the scoring for Larne four minutes before half-time with a curling finish into the top corner after picking up the loose ball from a corner. And the Championship’s leading scorer doubled the home advantage seven minutes into the second half with a lob over home keeper Gareth Buchanan. However the Villagers hit back with two goals in quick succession just after the hour. Gary Liggett struck on 63 minutes after pouncing on a defensive error to slot the ball beyond Conor Devlin.Then, moments later, Andrew Hoey struck from the spot to bring Loughgall back onto level terms. That was how it stayed until deep into stoppage time when Finnegan, a 91st minute substitution for Shane McEleney, popped up to scramble home Larne’s dramatic late, late winner. Knockbreda came unstuck in their attempt to extend their unbeaten start to the season against a solid , resolute defensive display by the visitors with centre back Denver Gage dominant. The opening play was scrappy and Breda gifted the first goal when their defence was caught napping by a quick throw in into their box to meet a darting run by Michael Smith who controlled the ball and shot low into the corner of the net. Breda’s best chances in the half were headers by centre forward Zach Barr on 26 minutes and 42 minutes although Rangers nearly scored a second when a Breda defender’s clearance hit their post. The second half was more of the same with Breda struggling to break down the Rangers defence and the visitors increased their lead on 56 minutes. A poor clearance saw Michael Smith pick up the ball in midfield and a slick passing move saw him clear in the box to finish well to give Rangers their first points of the season. 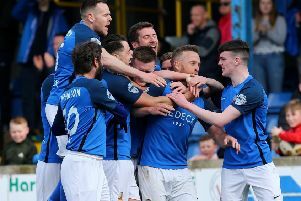 Dergview ran out comfortable winners against neighbours Ballinamallard in a first derby meeting between the sides in six seasons at Ferney Park. The Mallards started the game as firm favourites to secure their second home win of the season but the visitors hadn’t read the script and ultimately triumphed thanks to goals by Paul Smith, Garth Falconer, Philip Wallace and own goal that owed everything to the pace and precision of a wicked low cross from Andrew Sproule. Ballinamallard’s solitary response was a well-taken goal by Arkinson and their misery was complete when young right-back Sean McEvoy was carried off injured late on. Dergview took the lead when Paul Smith picked the pocket of a defender to round Connolly and open the scoring just 14 minutes in. That advantage lasted barely three minutes. A perfectly-weighted ball over the top by Nathan Cashel had the visiting defence claiming offside but referee Neil Robinson’s whistle wasn’t forthcoming and Arkinson galloped through to lob over Buchanan and into a gaping net. Both teams then had opportunities to take a half-time lead. Buchanan touched over a Ben McCann header from a Jay McCartney free kick before Dougherty flashed across goal after turning Matty Smyth in the wake of a probing pass from Kirk. The second half began with Campbell flashing wide on the turn and moments later substitute Warner Mullen just failed to get a touch on a driven low cross after good play by McEvoy and Arkinson on the right. Thereafter the visitors took control and it was Falconer, who scored a thunderous 30-yard volley against HW Welders seven days earlier, who set the Derg men on their way to victory just after the hour. Adam Buchanan took a quick throw-in to Smith on the right and after receiving the ball back again whipped over an inviting cross which Falconer headed high to Connolly’s top left despite the keeper getting a hand to the ball. The visitors were now full of running and with Mattie Callaghan and Philip Wallace coming off the bench to up the tempo even further, Allen’s men scented blood. Eight minutes later it was 3-1. After good play by Blaine Burns, left-back Mattie Buchanan played the ball down the left to Dougherty, who ushered in Callaghan and he crossed low for Wallace to slide home at the back post. Shortly afterwards Dougherty flicked on an Adam Buchanan pass to Sproule and the lightening-quick attacker dashed past McCann to drill in a wicked low cross which McEvoy could only turn into his own net. Late on frustrations boiled over when Lee McNulty, who along with Dale Maxwell ruled supreme at the heart of the Derg defence, went down clutching his head following an off-the-ball incident. The Welders were beaten at home by Portadown 2-0 thanks to goals from Adam Salley and Jamie Douglas. The opening period was fairly evenly balanced with the core of the play being contained to the midfield area. The Ports opened the scoring in the seventeenth minute when Salley lobbed Ryan Brown in the home goal. The visitors were starting to impose themselves on the game with the home side playing catch up. It came as no surprise when Portadown went further ahead after thirty three minutes when Douglas netted their second, tapping home after a deflected shot hit the upright and fell to his feet. The Welders just had no cutting edge and posed very few problems for Matthew Tipton’s men. On the resumption it was very much the Ports calling the tune and the Welders relying on an odd foray into the visitors half. Brown in the Welders goal was the busier of the two keepers at this stage as the pressure from the Ports increased. In one of the rare attacking moves Irwin for the home side saw his effort go wide in the sixty eighth minute. Substitute Rainey saw his effort go by the post after a skilful piece of interplay between him and Scott Davidson. With full time approaching there were no further goals but the Welders are badly in need of someone to score goals. Dundela continued their fantastic start to the season defeating the PSNI 2-1 at Newforge on Saturday afternoon.